Reigning champions Saracens will look to secure a third successive Premiership final appearance when they take on Leicester Tigers at Allianz Park on Saturday. Richard Cockerill's side are the country's most successful since the current league format was introduced in 1987, but the last of their 10 titles came in 2013. In the other semi-final, Exeter Chiefs, who are bidding to make it to their first Premiership final, take on a Wasps team who have not lifted the trophy since 2008. Which two sides will prevail to reach Twickenham on Saturday, 28 May? Venue: Allianz Park Date: Saturday, 21 May Kick-off: 12:30 BST Coverage: Live on BBC Radio 5 live, BBC Radio London and BBC Radio Leicester, live text commentary on the BBC Sport website and app. 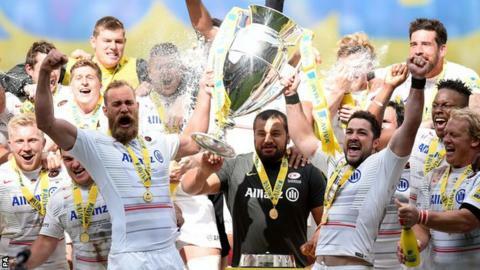 Saracens are looking to add a second successive Premiership title to their maiden European crown, which they won courtesy of a 21-9 victory over Racing 92 last weekend. Sarries finished top of the Premiership table after winning their final five league games of the season, with their last defeat coming at Leicester on 20 March. The north London side carried out a clean sweep at the Premiership awards on Wednesday, with Mark McCall being named director of rugby of the year, full-back Alex Goode player of the year and lock Maro Itjoe under-23 player of the year. The Allianz Park side have reached their seventh successive semi-final and have made it as far as the final four times in the last six years. "We are in uncharted waters in a way," said McCall. "Everybody understands we have put a huge amount into this Premiership season and it has been a real grind. "Leicester have been the benchmark club in England for as long as I can remember and we are still on their heels a little bit. "It is going to be a big challenge but we go in buoyed by our form, with players individually playing well and very motivated." Tigers have a remarkable play-off record, having reached the last four in each of their last 11 seasons. The Welford Road side made nine consecutive Premiership finals between 2005 and 2013, winning four titles, but Northampton and Bath stopped that run in the last two seasons. But Cockerill's team are very much the underdogs against the European Champions Cup winners, and Tigers club captain Ed Slater told BBC Radio Leicester the away tie presents a "big challenge". "This is everything you work for and this is what it is about," said Slater. "But we are facing a very strong Saracens side who are coming off the back of a European win. "Maro Itoje and George Kruis are a strong pairing for Saracens and England so it is an area of the game we will be focusing on extremely closely. "They are always making it a nightmare at the breakdown. There are certain parts of the game we are trying to put a lot of emphasis on. "They are strong and very organised and they get a lot of points off the opposition making mistakes because of the pressure they put on them, whether that is at the breakdown, a defensive line coming off very quickly or the opposition making poor decisions. "We know there will be a lot of pressure on us defensively when we have the ball so we have to be confident and decisive and not fixated on what they do." Venue: Sandy Park Date: Saturday, 21 May Kick-off: 15:15 BST Coverage: Live on BBC Radio Devon, BBC Coventry & Warwickshire and online, live text commentary on the BBC Sport website and app. A decade ago Exeter had just finished the season sixth in the old National Division One, trailing in the final league table to local rivals Cornish Pirates and Plymouth Albion, and having had trips to Pertemps Bees, Sedgley Park, Otley and Newbury to contend with through the season. But roll on 10 years and the club is the Cinderella story of English rugby - a battle against all the odds that saw everyone's favourites for relegation after they went up in 2010 gradually get stronger and stronger. Only European champions Saracens could better the Chiefs' league record this season - and they are the only side since the start of January 2015 to have won at Sandy Park. "I don't mind saying I'm nervous now," said head coach Rob Baxter prior to the club's first Premiership play-off match. "But I'm excited and I'm looking forward to what will happen when the game comes around. "We've improved our level of performance as the season's gone on, as the games have got bigger and bigger and more important, and that's what I'd like to see now,"
"I'd like to see us take the next step and play our best game of the season - I don't think that's too much to ask. "I think that's the players should be preparing for that and I would like to think that's what they want to achieve, they want to achieve their best game of the season this weekend." Wasps have lost just two matches in the last two months. The first was to new European champions Saracens, who beat them 24-17 in the Champions Cup semi-final on 23 April. Other than consoling themselves with the thought that they did at least lose to the eventual winners, there is little Dai Young's side can do about avenging that defeat until next season - or, of course, the final. But they can do something about the 24-3 defeat they suffered at Exeter in the Premiership eight days later. "We go down there as underdogs now," director of rugby Young told BBC Coventry & Warwickshire prior to Saturday's match at Sandy Park. "But there's no reason why we can't go down there and win. "We've got to learn our lessons from when we played Exeter last time. Defensively we were pretty strong, considering they had so much ball. What we didn't do was fire enough shots with ball in hand. "We've had to tinker with our attack. We need to get more penetration, play at a faster pace and go in with a lot more energy. And I'm sure we can cause them lots more problems. "We've got enough X-Factor players to cause any team problems."